The realm of adventure cruising is expanding. Once it was the iconic voyages to the frozen extremes, the iconic Galapagos or scenic Alaska, but now the world’s small vessels are heading inland to the remote rivers of Asia, South America or even Africa. Not satisfied with icebergs and polar bears, expedition cruisers now want to tick Amazon, Nile and Mekong off their lists of significant waterways. 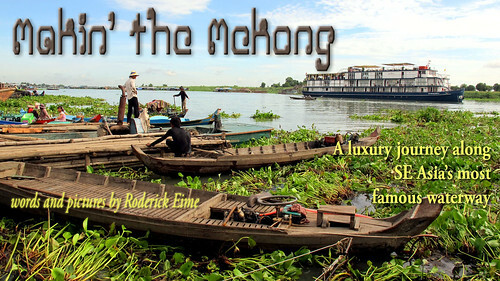 As mentioned in Cruise Weekly previously, Southeast Asia’s largest river, the Mekong is shaping up as a battleground for cruise operators as the new wave of luxury river vessels stake their claim on this famous waterway. One of the newest is Heritage Line’s 2009-launched Jayavarman, known also by its officially registered name of RV Mekong Explorer. Built in Vietnam in the traditional style of Asian river vessels, but styled apparently on the classic ocean liner ‘Normandie’. 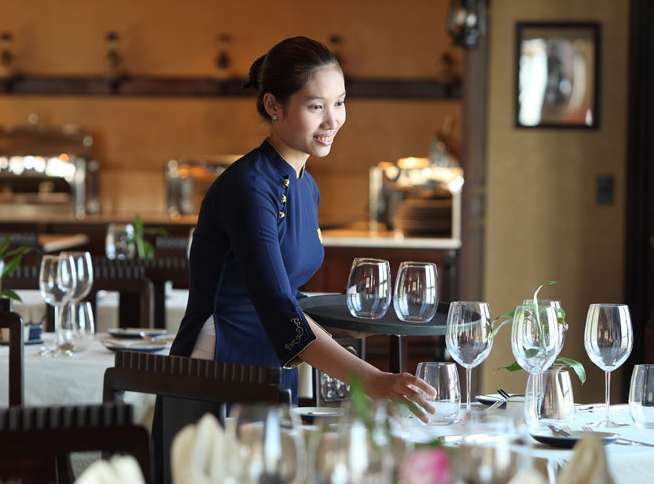 With 27 twin (or double) cabins appointed in a charming ‘old world’ style, Jayavarman transports guests in luxury on a journey beginning in the Mekong Delta port of My Tho. Our 7-night exploration continues upstream through the many convoluted tributaries of the famous delta, ending up in the main stream via such evocatively named stops as Cai Be, Binh Thanh Island, Chau Doc and Xin Chao. Shore excursions include village factories like rice mills, traditional industries such as brick-making and agricultural enterprises like fish farms and mat weaving. Mostly we are transported on comfortable local sampans with padded seats and shaded awnings with plenty of complimentary bottled water on offer. Okay, so it’s not the pyramids but it is an authentic glimpse into real life along the delta much as it’s been conducted for centuries. Across the border and into Cambodia, the pace of life slows and a day is spent in Phnom Penh touring all the things first time visitors have to see. But there’s time for a couple of mandatory Angkor Lagers in the iconic Foreign Correspondents Club before we set off early next day. We spend the next couple of days alternating between the Mekong and it’s sibling, the Tonle Sap before we are obliged to bus it to our final destination, Siem Reap. This is one caveat for travel at this time of the year, the low water season, as the Tonle Sap doesn’t yet have enough water to allow us into the big lake of the same name. It’s not the best part of the trip, so if you are dead keen to sail into the Tonle Sap, make sure you travel in the high season and pay the extra. Costs for the 7-night journey start at USD 3384 per person twin share in a superior suite, low season. The fare includes all meals and shore excursions (and bus), but not your port tax or visa fee. Food is a mix of plated and buffet sittings with delicious local flavours. Fish, chicken, pork, beef and spicy salads a-plenty – no-one goes hungry.